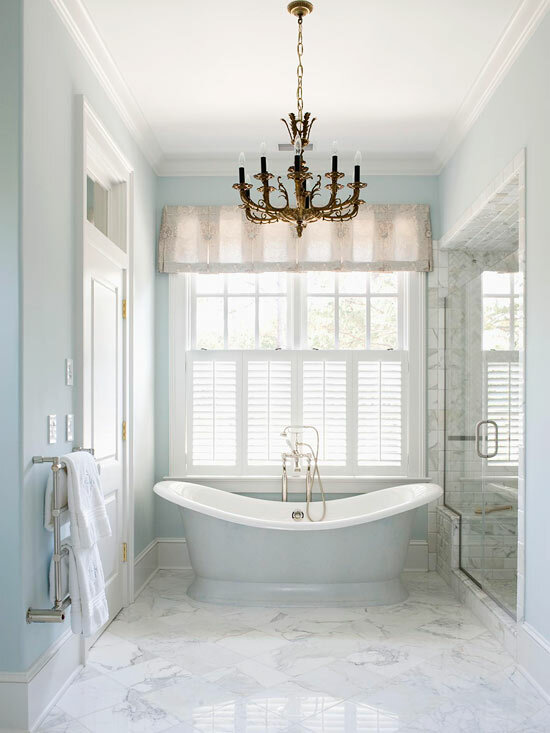 I think this bathroom is simply stunning. 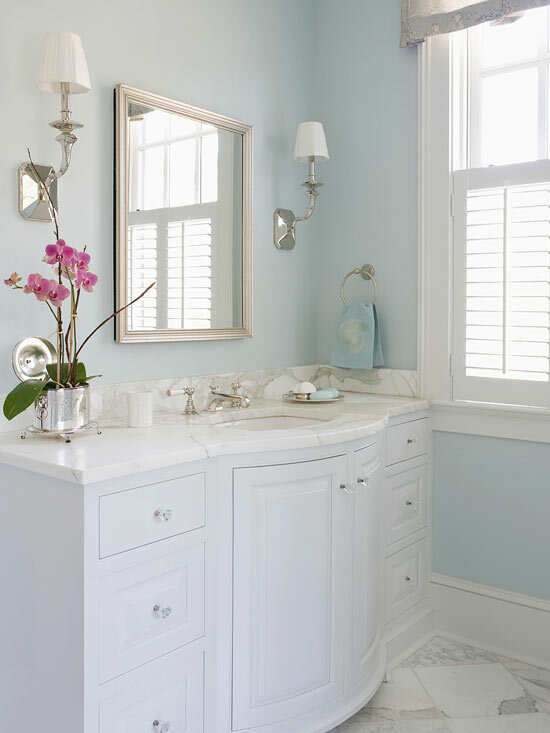 I love the colour palette - the light blue walls look beautiful - they make me want to repaint my walls this colour! 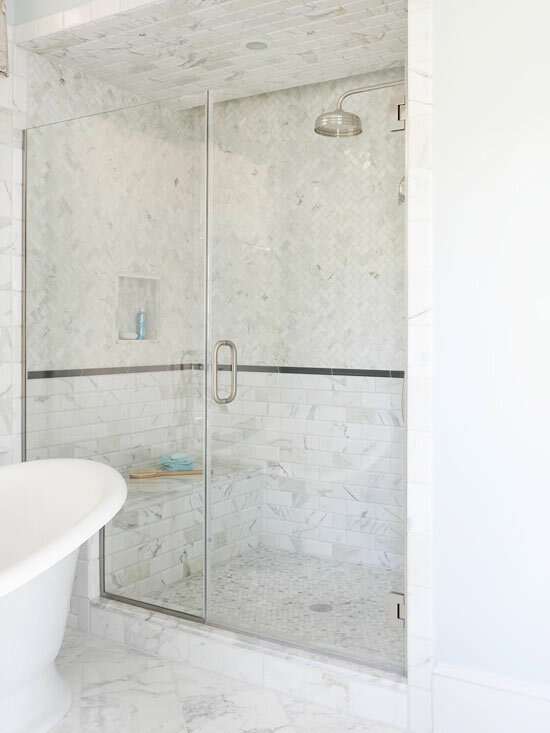 The Calacatta marble counter tops are rich and luxurious, the wall sconces sublime and the marble floor tiles are perfect. There is just one detail I don't like. It's got to do with the monogrammed bath towels, I'll talk about it a bit later. 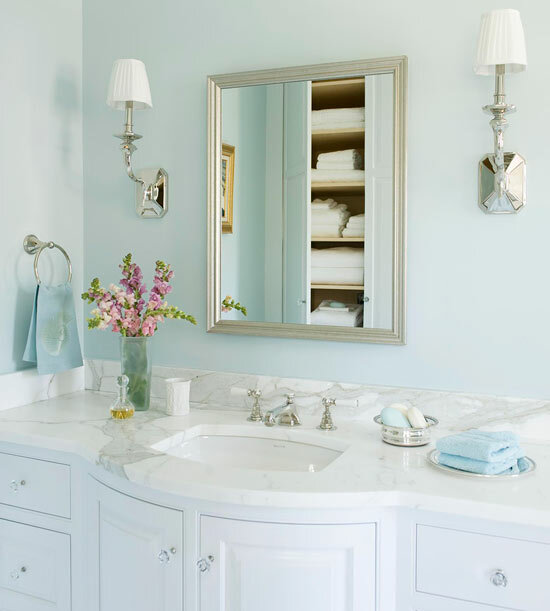 Otherwise, I think this French inspired bathroom is pretty perfect. 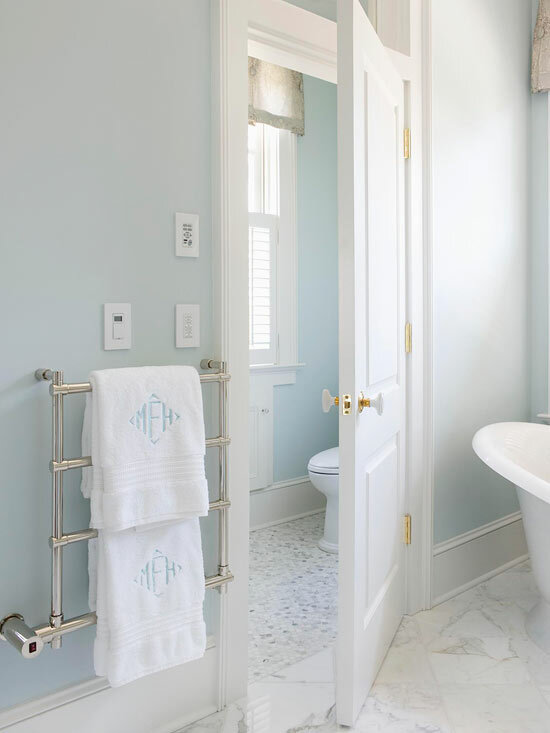 How perfect do these monogrammed bath towels look on this towel warmer? I love the light blue stitching of the initials. So, is there anything you would change about these Monogrammed bath towels? I'd change the location of the heated towel rack. Placed where it is the owners will have to walk across the bathroom getting the floor wet to reach their pretty monogrammed towels. This polished marble floor could become very slippery under their wet feet. Plus they'll have to wipe up the water after every bath or shower and put bath mats everywhere. I guess they could get two monogrammed bath mats to match their monogrammed towels! I bet most of the time the homeowners will be taking showers, so I'd position the heated towel rack on the open wall next to the shower. This way they won't get that awful freezing feeling when the air hits their wet body when stepping out of the shower and it will solve all the problems mentioned above. Now if only the shower door could have opened the other way, they wouldn't even have to step out of the shower to reach for their towel. They could have just opened the door a bit, pulled the towel off the heated rack, dried off inside the shower, keeping the bathroom floor dry and stayed nice and warm at the same time. Btw, did you notice the nice detail they repeated? 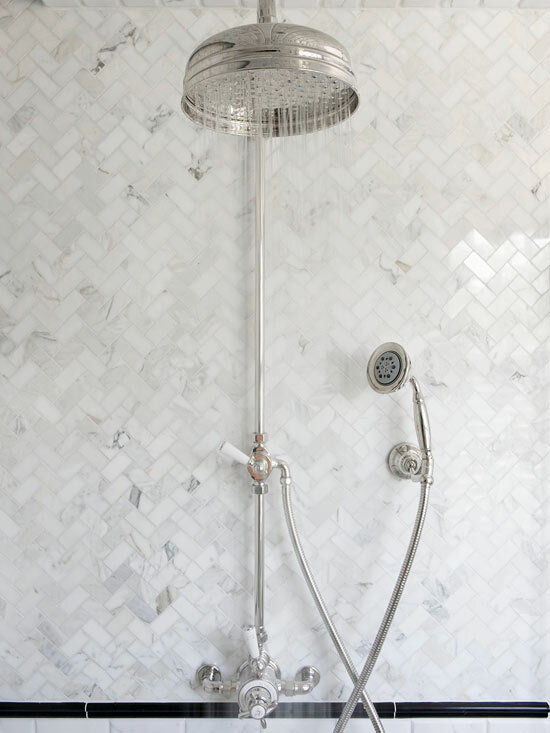 The little marble tiles they used for the shower floor are the same ones they used in the separate toilet area. I love this detail. Sure they could have continued the diamond floor pattern of the 12x12 marble tiles into the toilet area, but I think using the small floor tiles adds a cute touch. 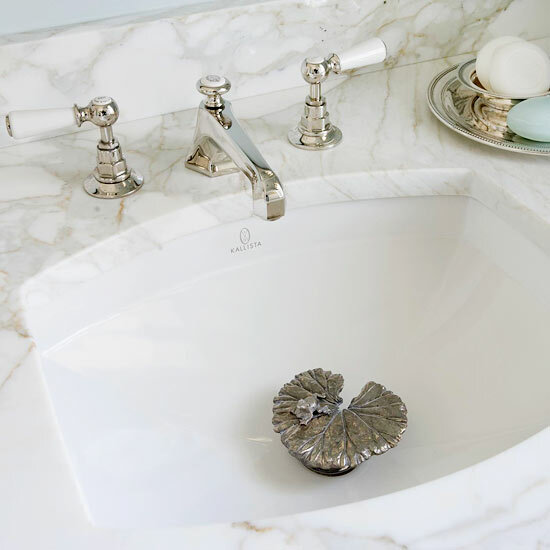 Just like the pretty little details of the frog on a lily pad drain stopper and the monogrammed towels, little details like which way a shower door opens or where the heated towel rack is located can make a big difference with how much you enjoy your bathroom. I find this bathroom incredibly romantic too, that's what really drew me to it. I love all the soft colours. Thanks for your comment, it's always great to hear what others think.